Of course, the core of your bike is the frame. It should be high-quality and stable, at a full suspension bike there will be additional comfort - independent of the wheel size - in the form of a rear-end shock. Depending on the alignment, the MTB frame determines the geometry of your bike and thus also the travel for which it is designed. Here, you'll find the fitting frames for building up a full suspension bike with a 26 inch wheel size. The 26 inch MTB fully suspended bikes convince by their manoeuvrability and actually outmatch the 29 inch bikes in this regard. But you'll still realize in today's time that the 26 inch full suspension bike frames go out of fashion, the 27.5 inch size is a hard competitor. But fatbikes have breathed new life into the 26 inch size (which owing to their large tyres ensure volume accordingly). And even small male cyclists and/or female cyclists still appreciate the 26 inch frames on the MTB full suspension bikes (it is said that the short standover height is very well-suited at little body heights due to the small wheel). You would like to build up your new dream bike by yourself and you deliberately do not want to buy it off-the-shelf? 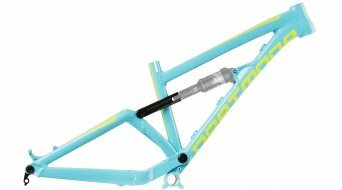 Then, you'll find the fitting frame for your individual build and/or a frame kit for a personalized 26 inch full suspension bike according to your wishes.